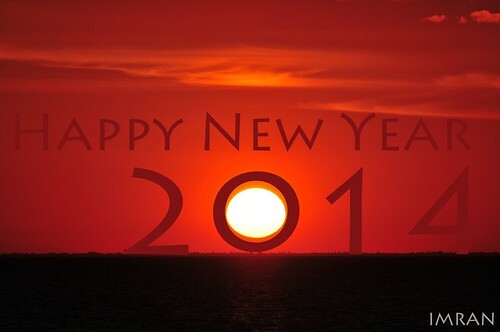 As Sun Sets On 2013, 2014 Begins To Appear – IMRAN™ — Happy New Year To All! As Sun Sets On 2013, 2014 Begins To Appear – IMRAN™ — Happy New Year To All!, a photo by ImranAnwar on Flickr. In every life there are bright mornings and dark nights, ups and downs, and everything in between. Some will be celebrating the best year(s) of their lives going by as the sun sets on 2013, while others will think it could not end soon enough. But, to all, each and everyone of you, my family, friends, fans, loves and loved ones, as well as all decent people of this beautiful planet…..
A Happy New Year, and all the best in 2014. The base SOOC image is Straight Out Of Camera with my 6 years old Nikon D300!! NO editing, tweaking, of ANY kind. Only added my greeting and name in Photoshop..